Here‘s the first part of this posting — four delicious songs from a quartet gig held in the basement funhouse that we know as Fat Cat (75 Christopher Street, Greenwich Village, New York) on September 30, 2015: the music-makers are Tal Ronen, string bass; Rossano Sportiello, piano; Jay Rattman, saxophone and clarinet; Kevin Dorn, drums — and guest magician Tamar Korn offering two Irving Berlin classics at the end of this post. 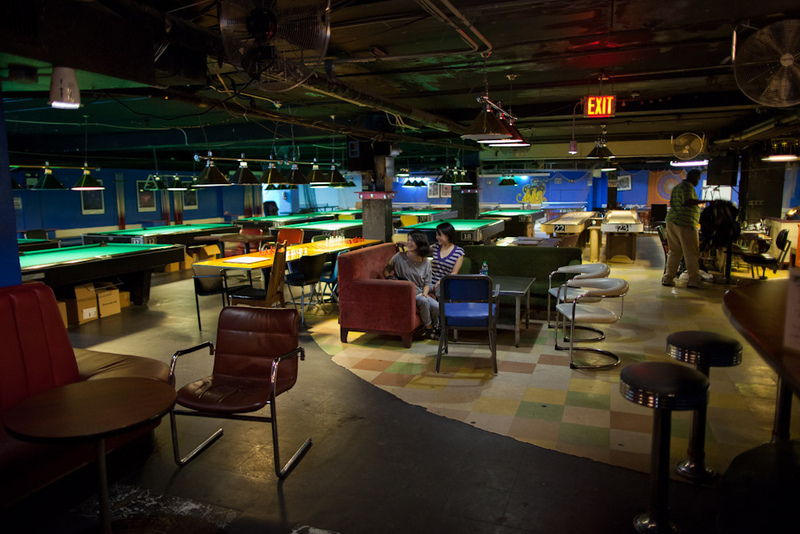 Fat Cat (75 Christopher Street, New York City) is a cavernous basement space notable for a bar, pool tables, chess sets, ping pong, other kinds of games, and an enthusiastic — often cheerfully vocal — young crowd. Since it costs three dollars to enter and have your hand stamped with a feline silhouette (I always respectfully decline), it is happily frolicsome down there. That is a gentle way of saying — for the members of the JAZZ LIVES audience who insist that music be played in reverent silence — that there is an audible background of human conversation and occasionally shouts and yelps of what I hope is pleasure. Once the music begins, it is easy to concentrate on the jazz, so don’t quail and panic. Unless, of course, you’d rather. Imagine yourself invited to a large party full of happy people where you can listen to a wonderful New York City jazz quartet for free. Generously, the kind and wise management also offers jazz of all kinds, from Terry Waldo’s happily loose Gotham City Jazz Band to much more modern experiments. More to come. 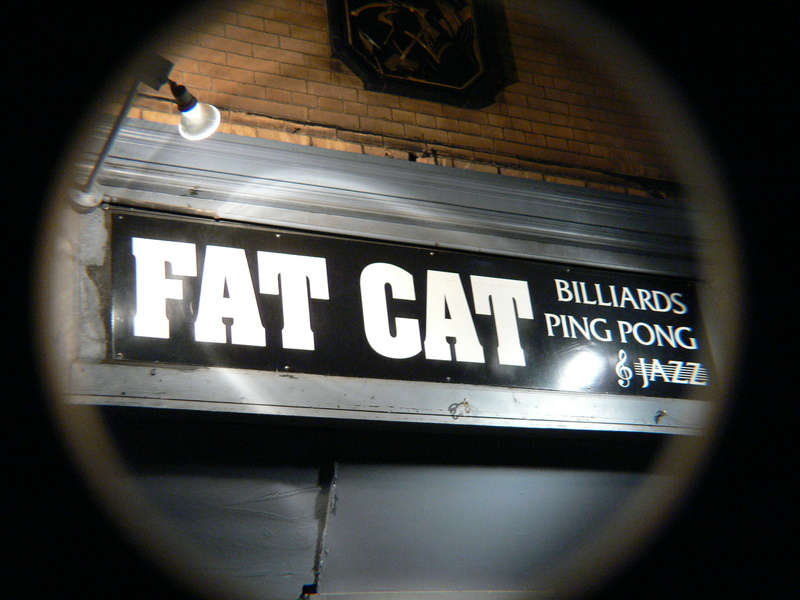 And the Fat Cat music schedule is available here, with appearances by a wide variety of fine jazz players, from George Braith to Ehud Asherie to Billy Kaye and Harold Mabern . . . Even in enhanced stereo (!) Louis looks young and healthy. But it will take a while for me to look close to that. The Beloved is 3000 miles away. My apartment has serious water damage . . . precious objects became damp, musty — some can’t be repaired. I feel as if spiritual mildew is creeping up on me, which is not something that responds to ordinary curative methods. While I was slumping around the apartment, wondering what else had been ruined and whether I could ever find everything, I knew I needed serious help of a medical kind. I apologize for the swooping camerawork but I was trying to create closeups without a tripod, and I think I was so happy that my hand possibly couldn’t remain steady. Somewhere, Fats Waller and Bing Crosby smile approvingly, too. This always makes me feel better, and I will now play it again while I do other domestic chores. This past Monday I spent yet another pleasant afternoon at the Louis Armstrong House Museum in Corona, Queens. The house is closed on Mondays, but it was a special occasion. I was there to train as a volunteer docent, someone who would give guided tours of the house. Being a volunteer in service to Louis Armstrong is the fulfillment of a lifelong dream for me, because I could never repay my debt to the man who has given me so much, not only his music but his attitude towards life*. The LAHM needs volunteers, but they are precise in their requirements: there’s an application form to fill out, an interview (pleasant but serious), references to provide, and several training sessions. The prospective volunteer is asked to make a six-month commitment and offer her / his services to the LAHM for one day a week, 10-5. You can fill out the application online: thatsforme. Serious stuff, but they don’t let just anyone take care of holy places. Yet it is absolutely uplifting to be allowed into Louis and Lucille’s house, to climb the stairs that they climbed, to see the mirrored bathroom and the dining room — with an Asian painting on the wall whose pictographs, translated, are PARADISE ON EARTH. 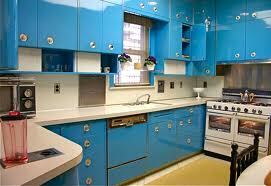 The extraordinarily shiny mid-century turquoise kitchen; the shiny mylar wallpaper (Lucille dug wallpaper and the insides of the closets are wallpapered in different patterns); the exhibit room with Louis’ gold-plated trumpet; the den where Louis spent much of his time listening to music, making his tape-recordings, talking on the telephone, practicing his trumpet, singing his songs. A portrait of Louis by Calvin Bailey; another by some Italian fellow. One of the most touching aspects of a visit to the LAHM is the soundscape. (How could you have a tour of Louis’ world in silence? Impossible.) 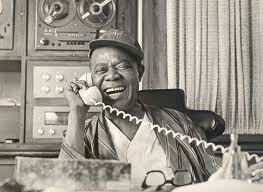 Moving from room to room, one hears excerpts from Louis’ homemade tape-recordings. Early on, Louis was thrilled by getting it all down “for posterity.” He knew his worth, and without immodesty, he knew that we would be listening to his life after he and Lucille were gone. I heard, once again, the sweet story of how, when Louis and Lucille were newly married in 1942, she wearied quickly of “the road,” of living out of suitcases, and decided that the new couple should have a home. She knew of a house in Corona, Queens, for sale — even then a comfortable blue-collar neighborhood, but one in which African-Americans were welcome — and purchased it without Louis having seen it. He was on the road perhaps 300 nights a year. When he was going to be in New York, Lucille told him about the house and gave him the address. Very early one morning in 1943, Louis caught a cab and had the driver take him to an 34-56 107th Street in Corona, Queens. Louis couldn’t believe this was his home at first, but he was convinced. And he lived in this house with his wife until his death in 1971. You may not want to be a docent at the House — that’s fine. Some of my readers will find the commute to Corona a bit taxing. But if the idea appeals to you, click wonderfulworld. But I encourage you to visit the Louis Armstrong House Museum and be in the spiritual presence of the man who changed and created so much of the music we love. You might want to absorb the aura of his great humanity, his generosity, his love for the music and his fellow men and women (including miniature Schnauzers). Or you might want to come and look at the wallpapers! (Lucille loved wallpaper and the house is a marvelous specimen of the best mid-century modern American interior decor, and that’s no stage joke.) Here’s the information you’ll need about the forty-minute tours: louis. The LAHM also needs your financial support . . . but you don’t need me to tell you this. Become a member or make a contribution: swisskriss. These days, everyone’s bucket has a hole in it, but holes can be patched. Just to get you in the mood, here is Louis performing that pretty song, HOME. 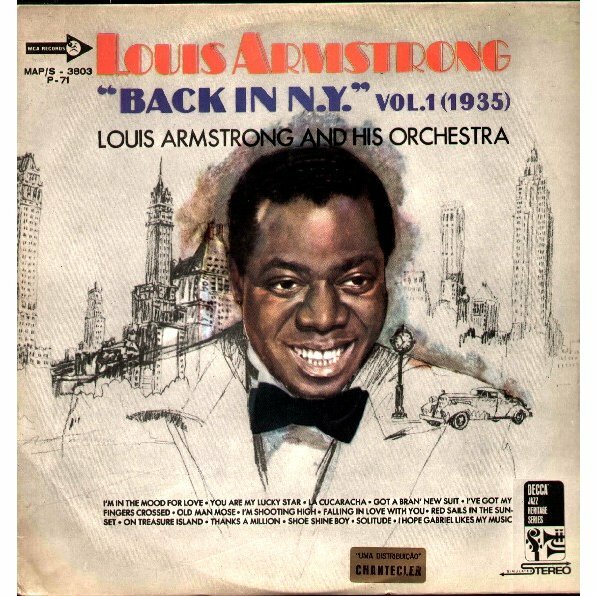 Louis and Lucille Armstrong loved their neighbors — the neighborhood kids ate ice-cream in the living room and watched Westerns on television. If they were alive today, they would be inviting friends to the house for good times. The House itself welcomes you. Within its tidy rooms Louis and Lucille are alive. Make a date with yourself and your Beloved to pay them a call in the most down-to-earth shrine you will ever visit. *And here’s what I mean by Louis’ attitude toward life — I wrote about it some time ago: what-would-louis-do. Some months back, my friend — jazz photographer John Herr — told me about an invaluable resource for people trying to track down sheet music. You remember sheet music, don’t you? Sheet music (individual publications for specific songs, often with beautiful Art Deco cover illustrations and portraits of the artists — famous or obscure — who performed the songs) was once a predictable part of any even mildly musical household. Before the iPod, when people relied on records and the radio for the hits of the day, they more than not played those hits on the piano, guitar, ukulele, or sang them together. 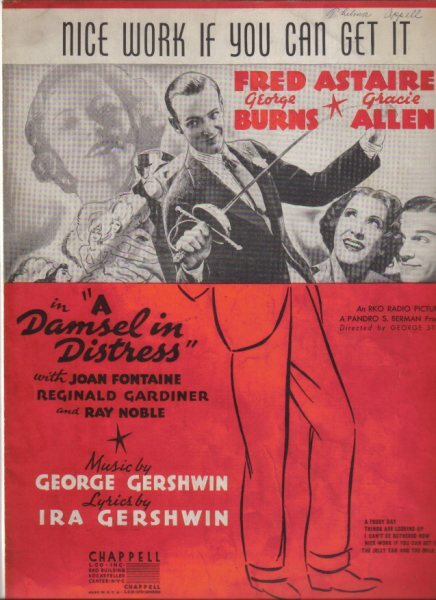 When the newest Astaire-Rogers film came out, or Bing Crosby sang something pretty on the radio, the sheet music was right there. Those of us who love jazz and pop music are fascinated by these sheets, and readers have seen a good number of them here: James P. Johnson, Fud Livingston, Ben Pollack, Louis, and many others. But sheet music was inexpensive and printed on fragile paper, so the years have often not treated the pages well. So if you have a deep need to find the sheet music (words, music for verse and chorus, ukulele chords) for NEVER SWAT A FLY or IT LOOKS LIKE RAIN IN CHERRY BLOSSOM LANE or even I’VE GOT ELGIN MOVEMENTS IN MY HIPS (WITH A TWENTY-YEAR GUARANTEE), you could go on eBay and you might find the sheet music for sale; some is even available at Amazon. But here’s a better way — intelligent, reliable, and inexpensive. It’s the MOTTO COLLECTION at the FAYETTEVILLE FREE PUBLIC LIBRARY in Fayetteville, New York. But please don’t panic at the unfamiliar name. You don’t have to find Fayetteville on the map to get ready to make an automobile pilgrimage. It’s easier than that. But first: the collection contains 35,000 sheets of popular American songs from the last 150 years. It also includes 900 music and reference books which circulate. The sheet music presents a chronological picture of American life and popular culture from the Civil War through the 1980s. The Collection was donated to the library by the late Lucy Motto in memory of her husband, Vincent, who died in 1995. Vincent was an amateur collector who pursued his interest for thirty years (he had sung with bands in Utica and Syracuse). Rod Hampson, a long-time community volunteer, became the collection’s first curator in 1996. It is now taken care of by Roberta Hampson (who won’t mind overmuch if you call her “Bobbi”: she is very friendly) who knows a great deal — she is a wonderful resource in herself. To reach Mrs. Hampson, you may call the library at 315-637-6374 or leave a message for her at extension 328. Or you may email her at mottomusic@fayettevillefreelibrary.org. The collection is meticulously indexed with extensive cross-references; if you are searching for a particular song, for a theme, for personal entertainment or scholarship on a larger scale. It continues to grow through donations and subscriptions. About those donations: if you can’t sleep at night because you need the music for IF YOU’RE A VIPER, check with Bobbi Hampson to see if the collection has it. The library requests a donation of at least $3.00 for a song, plus postage if it’s mailed to you — a pittance compared to eBay. And soon you can be playing and singing MAKE MY COT WHERE THE COT-COT-COTTON GROWS at home. Amaze your friends and delight your neighbors! Posted in "Thanks A Million", Generosities, Ideal Places, Irreplaceable, Jazz Worth Reading, Pay Attention!, The Heroes Among Us, The Real Thing, The Things We Love, Wow! COME AND JOIN THE JUBILEE! I had the great pleasure of meeting the Louis Armstrong scholar Ricky Riccardi at the Armstrong Archives (they’re in the Queens College Library and they’re a marvel) so that we could have a brief chat about his new book, WHAT A WONDERFUL WORLD: THE MAGIC OF LOUIS ARMSTRONG’S LATER YEARS (Pantheon). The book will be out on June 21 although you can pre-order it on Amazon. Now do you understand why Louis smiles while Ricky is speaking? You’ll have another opportunity to meet Ricky, to buy an autographed copy of his book . . . and where better than at a summer garden party at the Louis Armstrong House Museum? The book party will take place in the Armstrong Garden at the Louis Armstrong House Museum, Sunday, June 26 from 2-4 PM. Tickets are $35, which includes an autographed book, a guided tour of the Armstrong House and refreshments. $25 for LAHM members. Reservations can be made at: reservations@louisarmstronghouse.org. For further questions call the museum at (718) 478-8274. 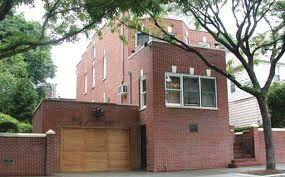 The LOUIS ARMSTRONG HOUSE MUSEUM is located at 34-56 107th Street, Corona, Queens, New York City 11368. It’s easy to get there by car or by public transportation. If you can’t come to the party, I hope you will buy a copy of Ricky’s book and consider becoming a member of the Louis Armstrong House Museum — a down-home shrine visited by people from every country on the globe. Members support their mission — making sure the joy Louis spread is never forgotten — and receive exclusive benefits throughout the year, including: free admission for historic house tours, special member discount to all events, a subscription to Dippermouth News, a sneak peek of upcoming events, 10% discount in our museum store, pre-show parties with other members, and much more. Posted in "Thanks A Million", Generosities, Ideal Places, Irreplaceable, Jazz Titans, Jazz Worth Reading, Pay Attention!, Swing You Cats!, The Heroes Among Us, The Real Thing, The Things We Love, Wow! Oh, I absolutely have to start practicing! Do I have enough time to become semi-amateurish by September 2011 . . . . ? Chautauqua’s first ever Traditional Jazz Workshop will be held on the beautiful grounds of the Chautauqua Institution in western New York, with your home base at the historic Athenaeum Hotel. The 4-day session will include ensemble workshops, coaching, jam sessions, and performance opportunities in student groups and with faculty members. Students will focus on jazz standards and works from the American Songbook, with emphasis on improvisation and ensemble performance. Enjoy social events with faculty and fellow students on beautiful Chautauqua Lake. The workshop culminates in a performance opportunity at the opening session of the 14th Annual Jazz at Chautauqua traditional jazz party on Thursday evening. Tuition for the workshop will be $550 USD; the lodging and meal package at the Athenaeum Hotel will be $525 per student (single occupancy) or $775 (double occupancy) USD. Stay on for the annual Jazz at Chautauqua party and receive a 20% discount on your food and lodging. For reservations at the Athenaeum, call 1-800-521-1881 or email athenaeum1881@hotmail.com. For information about the workshop, contact Nancy Griffith at 216-956-0378 or email her at nancylynngriffith@yahoo.com. I wasn’t quite serious about practicing enough to be accepted into the workshop in time for September, but I meant “A Splendid Present” emphatically. Many older jazz fans lament the impending demise of traditional jazz. Why not give the art form we love a blood transfusion from young folks — that grandson of yours who has just discovered Teddy Bunn, or that niece who is trying to play Cootie Williams’ growls on BENNY’S BUGLE — being able to attend this workshop and learn from these genial masters could be a life-changing event. And you don’t have to be a raw youth to come aboard, either . . . if you yourself would like to sound more like Benny Morton or Tricky Sam Nanton, this is a heavensent opportunity. Maybe I should sign up for the singers’ workshop just to be taught breath control by Rebecca Kilgore . . . now there’s a thought. See you in Chautauqua, and don’t be late! Posted in "Thanks A Million", Generosities, Ideal Places, Irreplaceable, Jazz Titans, Pay Attention!, Swing You Cats!, The Heroes Among Us, The Real Thing, The Things We Love, Wow!